The Trenholm Artists Guild will hold its 35th Annual Juried Art Exhibit from January 21st through January 31st, at Vista Studios/80808 Gallery, 808 Lady Street, Columbia. Bruce Nellsmith will judge the show. Awards will be presented at the opening reception on Thursday, January 21, 6-8 PM, as part of the Vista Third Thursday. The public is invited; those in attendance will also vote for a People’s Choice Award. The show will include approximately eighty 2 and 3-dimensional art pieces created by many renowned midlands-area artists. Meg McLean’s acrylic, piece “Bloomin’ Okra,” won the 34th annual Best of Show award. Other recent top award winners of TAG’s juried shows are Pete Holland, Mark Conrardy, Karen Langley, Denise Greer, and Jackie Brantley, and Regina Moody. 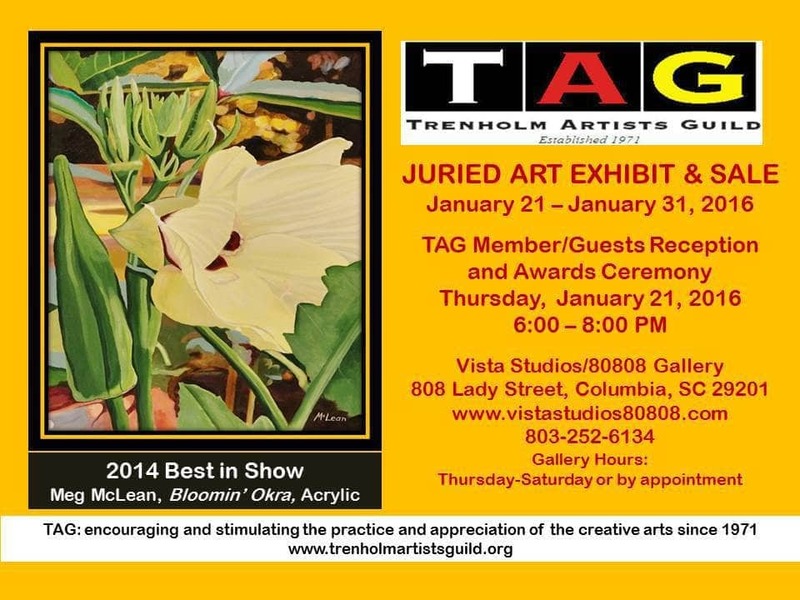 Trenholm Artists Guild, also known as TAG, has a membership of over 200. The group includes both amateur and professional artists who work in all media. Established in 1971, TAG is an incorporated, non-profit organization located in Columbia, South Carolina. It is designated an IRS 501 (c) (3) organization. TAG was created to encourage and stimulate the practice and appreciation of the creative arts among the people living in the greater Columbia area of South Carolina. To achieve this goal, TAG works cooperatively with other groups to help build audiences and participation in the arts. ← Who will the new artist be? !